Leonard Richardson analyzed a hundred different web service designs and divided them into four categories based on how much they are REST compliant. This model of division of REST services to identify their maturity level – is called Richardson Maturity Model. These services have a single URI and use a single HTTP method (typically POST). For example, most Web Services (WS-*)-based services use a single URI to identify an endpoint, and HTTP POST to transfer SOAP-based payloads, effectively ignoring the rest of the HTTP verbs. Similarly, XML-RPC based services which send data as Plain Old XML (POX). These are the most primitive way of building SOA applications with a single POST method and using XML to communicate between services. Level one of maturity makes use of URIs out of URI, HTTP Methods, and HATEOAS. These services employ many URIs but only a single HTTP verb – generally HTTP POST. They give each individual resource in their universe a URI. Every resource is separately identified by a unique URI – and that makes them better than level zero. 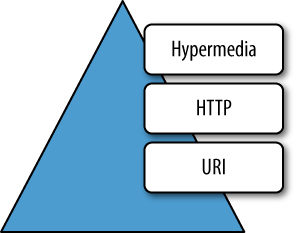 Level two of maturity makes use of URIs and HTTP out of URI, HTTP Methods, and HATEOAS. Level two services host numerous URI-addressable resources. Such services support several of the HTTP verbs on each exposed resource – Create, Read, Update and Delete (CRUD) services. Here the state of resources, typically representing business entities, can be manipulated over the network. Here service designer expects people to put some effort into mastering the APIs – generally by reading the supplied documentation. Level 2 is the good use-case of REST principles, which advocate using different verbs based on the HTTP request methods and the system can have multiple resources. Level three of maturity makes use of all three i.e. URIs and HTTP and HATEOAS. 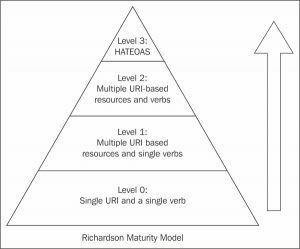 This is the most mature level of Richardson’s model which encourages easy discoverability and makes it easy for the responses to be self-explanatory by using HATEOAS. The service leads consumers through a trail of resources, causing application state transitions as a result.